On occasion, a web part may be causing your SharePoint pages to throw an unexpected error. An unexpected error has occurred. Web Parts Maintenance Page: If you have permission, you can use this page to temporarily close Web Parts or remove personal settings. For more information, contact your site administrator. 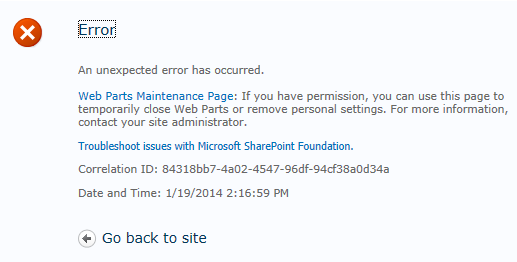 Troubleshoot issues with Microsoft SharePoint Foundation. In addition to leveraging the ULS Logs, to investigate the Correlation ID, you can append "?contents=1" to your page URL. This will allow you to close web parts, restore defaults to web parts, or delete web parts from your page.